I guess I'm old-fashioned; I like going to the pharmacy to pick up my prescriptions. I use two local pharmacies; I have favorite clerks at each one. They know who I am, and I guess that's flattering - or it's reflective of the number of prescriptions I've had filled in the last 8 years. Having grown up in the country, where we generally only went to the grocery on Saturdays, I find it useful to have an occasional excuse to go into town when I might not otherwise be going. It doesn't hurt either that the pastry shop is on the same street as both pharmacies. My Nexavar comes by mail through my insurance company. Every month I get a call reminding me that I need to refill it, and they carefully schedule the delivery. I find that rather amusing on two counts: I'm usually home during the day so I'm not likely to miss it; and FedEx doesn't come to the door to deliver it to me. At least they do drive down that long lane and drop it off at the house, rather than leaving it at the mailbox. If I chose to go to another pharmacy I would pay full price for Nexavar, and that would empty the coffers pretty quickly. The drug is expensive, though not the most expensive one on the market these days. There's probably a price break (hmmm, Nexavar in bulk? - scary thought; I wonder how many of their customers need Nexavar) and, by requiring that I get it through their specialty pharmacy, the insurance company is able to realize that price break on all the absorbed costs. I certainly won't complain about getting this drug on a co-pay when it could brook total financial disaster otherwise. My local pharmacies don't have Nexavar on their purchase lists, or at least they didn't when I started my prescription in 2006. It would be a hassle for them to get it just for me, aside from the cost that would be passed on. On the whole this arrangement works well. We're hoping for rain but the weather isn't cooperating; maybe tonight, maybe sometime next week. I'd sure like to get another cutting of hay off but we need rain for that to happen. In the meantime we're planning to complete the hoop structure, cut brush in the woods, and squeeze in a picnic over the holiday weekend. Happy (and safe) Labor Day to all! I went off on the quasi-annual girls' pilgrimmage to the Michigan Fiber Festival in Allegan MI over the weekend. After complaining about finances in my last post, I suppose I should be ashamed that I went in the first place, and that I spent any money at all beyond room and board. But I'm not ashamed enough to stop going, or to stop buying fiber for that matter. I buy from small businesses and individual vendors, and most of what I purchase gets made into gifts for other people - so is that justification enough? Maybe, maybe not. But at least I'm not drinking, or using drugs (beyond prescribed medications, that is!) 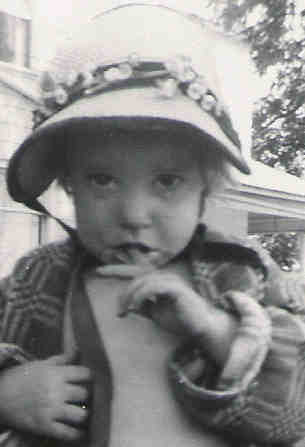 Maybe fiber is a drug, though; I certainly think I'm addicted beyond redemption. Whatever - it's good to be home! Starting next week Saint H begins spending one night a week in Columbus with friend and sister C2, to cut down on commuting costs. If need be, as time goes on, he'll spend more nights there. Fortunately she's a darned good friend - mine for 22, almost 23 years now, his for 37 years. He can potter around in her lovely backyard garden, or help with chores, or sit and vegetate while he's there. I have been urging him to do this for a while now, but the dollar signs have become bigger than his objections. We're not going to starve, and hopefully we won't go bankrupt, but given the large number of unknowns in our finances (how much is gas going to cost? What about LP gas for heating? What do we hold back for medical emergencies?) we have to economize. This was an easy decision, but unfortunately there aren't that many "options" in the budget. We'll get by unless the entire economy tanks, in which case there will be a lot more worries to bedevil us. Every time I hear someone talking about "those on a fixed income", implying seniors and retirees, I almost have to laugh. Aren't we all on a "fixed income", for better or worse, if we're on salary? Who has the freedom of economic security these days? I figure that I've lost about $150,000 in salary alone, disregarding benefits or raises or other "perks", since my illness became more demanding in 2004 with surgery and subsequent retirement. I haven't been able to contribute to my retirement accounts for 4 years. Maybe I wouldn't have used that money wisely, but I'd sure like to have had the chance. This stupid disease has robbed me of my health and my comfort, as well as my security. I hate renal cell carcinoma! Two summers ago my brother and sister-in-law came to visit. He brought me a surprise, a copper trellis he'd made himself (who knew?) The trellis sits this year at the north end of the porch distracting our view from the railings-from-hell that won't take a paint finish. Our hummingbird feeder hangs from the porch soffit just above it. 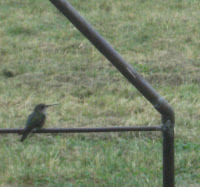 And this year's crop of hummers have decided that the trellis is the perfect place to rest between feedings. It's a great view out of the dining room window, for sure. Yesterday we decided to start putting together a commercial hoop shelter for all the farm equipment. Some starts and stops (I read instructions, he doesn't; and sometimes the instructions aren't very helpful and/or are downright misleading); then we got to the part that said "Lean the end rail against something permanent, such as a fence or tree, that is close to where the building will go." Friends, we have no fences. We have no trees. We finally pulled up the old S-10 pickup and used that to "lean" against. Himself is going off to Menard's tonight to buy an articulated ladder so we can get the cover on when the structure is done. Friend and sister C2 said, "Why doesn't he just stop by on the way home from work and get mine?" But who am I to stand between him and ladder lust? 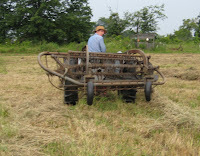 Yesterday I was pottering around in the kitchen; Saint H was outside swapping the mower for the hayrake on the tractor. For no known reason I decided, "I need to go see if he needs any help", grabbed a pair of gloves and wandered outside. I found him sitting in Emma's shed, abnormally quiet and pale. I asked, "Do you need any help?" He responded, "Yes. I just dropped the mower on my foot." This isn't the first time something like this has happened. How did I know he needed me? How does he always know when I'm not feeling well? For that matter, how does he always know when and where to look up in the sky to see hawks flying, even when they're somewhere behind him? If there's such a thing as sharing a wavelength, I suppose we do; we've lived together now for 19 years. Yes, we do complete each other's sentences. I'm not sure that the raptors and accipiters feel it too; maybe they look down when they're overhead and say, "See, there's that guy again. Funny how we always catch a glimpse of him when we fly over this way." I'm glad to say that, short of a nasty bruise and some stiffness, there doesn't seem to be any major damage. Thank goodness for steel-toed boots. Yesterday found us in Cleveland for the next round of appointments. Once again, labwork was good; scans were stable. Lesions in the liver appear to be stable; the lesion in the right lung continues to increase in volume but not in size. I wish I knew more about the mechanisms of tumor growth so that I can understand better what this means. At this point I know that Dr. G is not concerned about it, so we're staying with the current regimen of Nexavar and attendant medications. Dr. G is pleased enough, in fact, that I'm not scheduled for the next set of scans until November! I've been on a 2-month schedule since January 2006, when I started on Nexavar. Somehow it feels like a "great leap forward". I worked with a new nurse for the C/T who asked, "Have you had a C/T scan before?" When I stopped giggling, I started mentally adding up how many scans I've had since 2000. By my estimation I've had at least 46, and there are probably more that I don't remember that took place in hospital or under emergency conditions. I'd like to say, "That should be enough for anyone" but I know I'll have to keep up with them for the rest of my life. Hmm, 2 450-ml bottles of Redi-Cat barium sulfate solution for each test - translate that into gallons and that's enough to kill my appetite permanently. Saint H spent part of last weekend mowing and raking the last of the hay, and our buddy Rex arrived Monday night to bale it. He finished up about half an hour before storms hit; talk about making hay while the sun shines! We ended up with just short of 11 tons of hay - not bad for the first effort. We should get at least one more cutting off before the season's over. Occasionally I have the chance to take care of Saint H, rather than the other way around. Yesterday was one of those times. He's had plenty of dental problems over the years, and one tooth in particular has had its share - 2 root canals and a crown in the past. Not long ago that tooth sparked up again; X-rays showed infection in the bone, requiring an apicoectomy, or "root end resection," or "endodontic microsurgery." Whatever one calls it, it's not all that uncommon. It's also a rather extensive procedure; he was in the chair for 90 minutes. He emerged with fat lip and bruised cheek and four prescriptions. While on the way to the pharmacy, he asked casually, "Did you hear the commotion while I was back there?" I'd heard voices coming from the back and there'd been some bustling about, but it's a busy office and I was knitting so hadn't paid much attention. Turns out the procedure is also rather gruesome; the endodontist had a trainee technician who'd never assisted at one before. When he started removing bone, she fainted. I guess I've never thought much about how one confronts medical procedures, except as a patient. We're lucky, in some ways; only rarely are we not medicated or sedated or otherwise treated so that the full impact is mitigated. Plus, we don't have to see what's going on most of the time. As Judy, the regular tech, told Saint H, "If she really wants to do this job, she's going to have to get used to it." Is it more bearable for the assistant to know that the procedure will, in the long run, probably make the patient feel better? I suppose that would be the saving grace for me.